I believe in smoothies: fruity or vegetabley, thick or thin, chunky or smooth. In fact, I’ve written about smoothies a lot on the blog (here, here, and here, for example) since I rely on them for breakfast so often. But I have never chatted with you about a smoothie topic like this before. Joining the likes of Blue Apron and Plated dinner kit delivery services, but with a focus on your first meal of the day instead of your last, Daily Harvest will ship smoothies to your door. 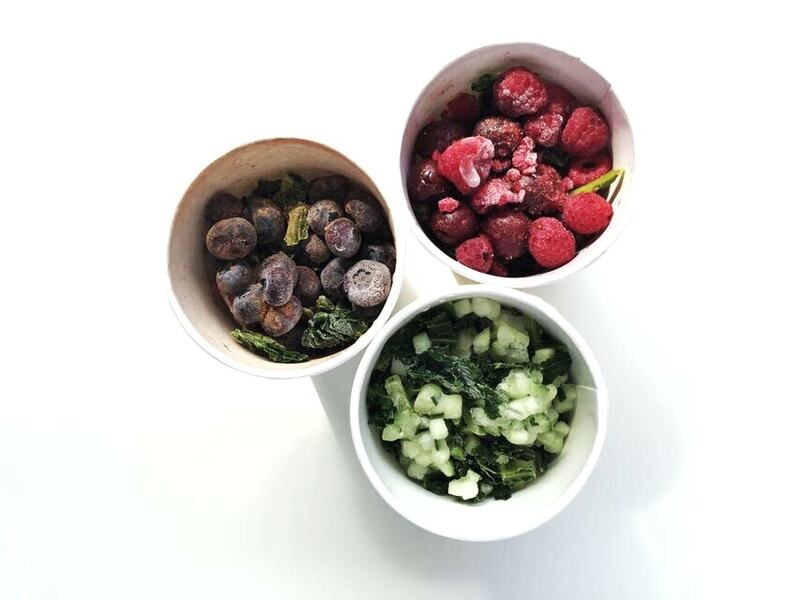 Well, the ingredients anyway: single serve smoothie kits, already portioned, frozen, and cozily nestled in a cup. You do the actual smoothie making by dumping it all in the blender, adding liquid, and pushing “power.” That means you get a healthy breakfast without any of the recipe hunting, or the shopping, dicing, peeling, juicing, seeding, measuring, and dirtying of many dishes during the morning rush. With Daily Harvest, you blend, pour it all back into the paper cup it came in, and just rinse out the blender. No muss, no fuss. Is all this convenience worth it? I signed up for 2 weeks of the service to find out. Actually, I intended to sign up for 2 weeks but didn’t cancel before the deadline so ended up with 3 weeks or 18 smoothies. One week’s order got repeated the next week, so I got two tries at the tasting of those particular flavors, and felt like a doofus. This actually highlights one of my struggles with these delivery services. You often have to know a week ahead of time that you want to pause or cancel your subscription, and if you miss that cut off you get an unintended delivery. I mean, I drank ’em. I’m not saying they were wasted. And I guess I’d have to say I had 18 darn convenient breakfasts. Let’s consider the cost: $47.94 for 6 smoothies means you’re essentially paying $7.99 for each one, which seems a little pricey. OK, a lot pricey. Maybe that’s why they call them “premium smoothies?” For comparison, the Evolution Fresh smoothies at Starbucks are $5.95, and the Jamba Juice equivalent ranges from $4.80-5.65. It would be hard to do a direct price comparison with making them on your own at home since for example, for the watermelon smoothie, I’d have to buy a whole watermelon when I only need 1 cup. But I feel fairly confident I could recreate them, at least those with the simpler and shorter ingredient lists, for less than eight bucks a cup, especially if I batched it and made several of the same kind at once. Like with most similar products you’re paying for the time savings and the convenience of having them delivered essentially right into your freezer. 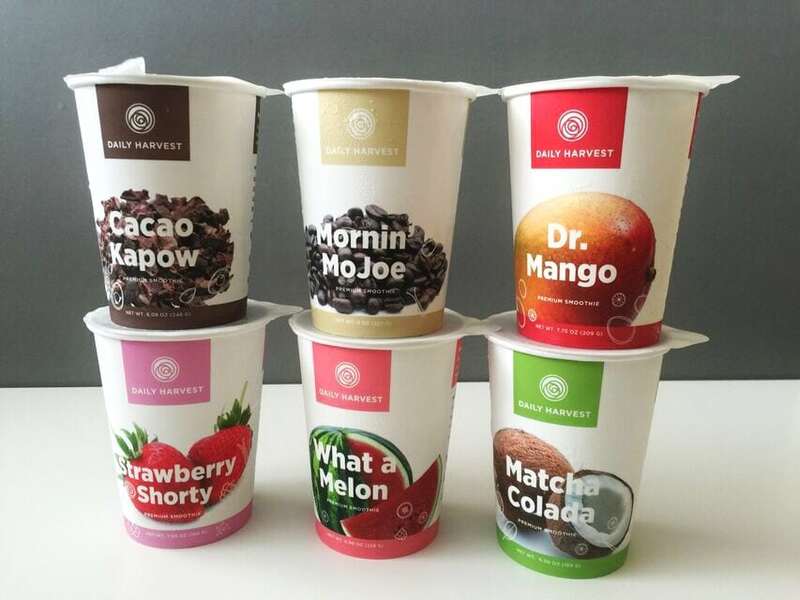 Each smoothie from Daily Harvest is vegan with mostly all organic ingredients. It’s pretty much exclusively real, whole foods and if they use a sweetener in a particular recipe, it’s always dates. Whether you’re instructed to add water, coconut water, or a creamy liquid like almond milk depends on the individual smoothie. 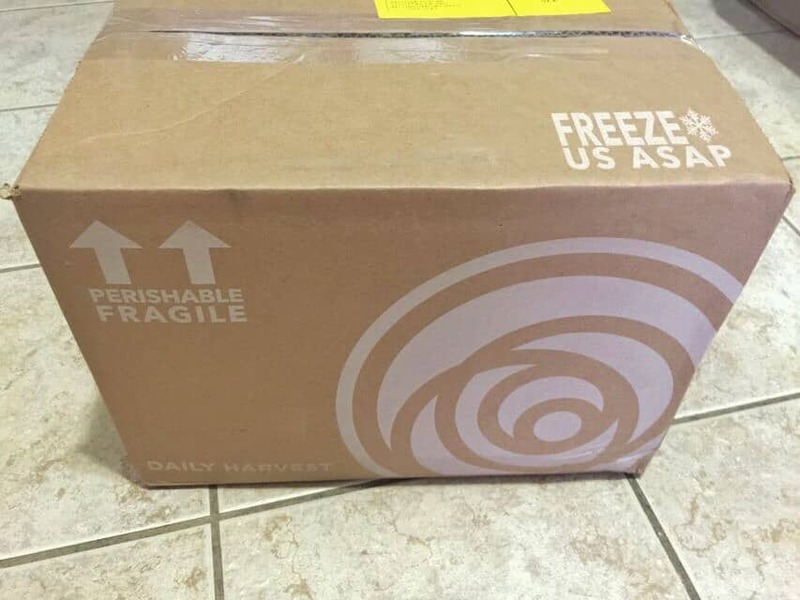 They come packed on dry ice and keep in the freezer for up to 3 months, but each delivery only lasted 1 week at my house. The fact that they’re made from seeds, vegetables, fruit, and nut butter means they’re a pretty nutritious way to start your day. But beyond that, the actual nutrient content varies incredibly widely from smoothie to smoothie. Depending on the particular mix of ingredients, they are all over the map in terms of calories, protein, fat, etc. so it pays to read each label before the frosty beverage goes down the hatch. At the low end, Green Monkey a has 100 calories (or 150 once you blend it with coconut water). This is so low in fact that I’m not sure it would constitute an entire breakfast all on its own. On the high end Chocolate Lovahhh has 410 calories (or 440 with almond milk). Protein content ranges from 2 to 14 g before blending, and fat from 1 to 28 g. Keep in mind the nutrition facts on the label are for just 1 cup, so I’ve doubled the values assuming you’d drink the whole thing. Who are we kidding? You are going to drink the whole thing. Now on to the important part…what did they taste like? In order of preference, I’ve listed them here starting with not delicious and progressing to terrific. Nutrition info is for the whole portion, or 16 fluid ounces, as packaged and without added liquid. Totally boring with soymilk, and totally boring with coconut water. I didn’t even want to finish it. This was better with coconut water than plain water but had an odd powdery aftertaste that I’m attributing to the camu camu. A good mix of lime and coconut flavors, this one was also noticeably better with coconut water than plain water. But overall it kind of left me underwhelmed. I love peach smoothies, but this particular mix didn’t charge up my taste buds. Each ingredient is rather mild in flavor and together they didn’t elevate each other. My immediate thought was that it needed some lemon juice to brighten things up. The pale green color, hint of mint, and chunks of cacao nibs are subtly reminiscent of chocolate chip mint ice cream, but otherwise there’s not a lot of supporting mouthfeel or taste to adequately be compared to its frozen dessert namesake. 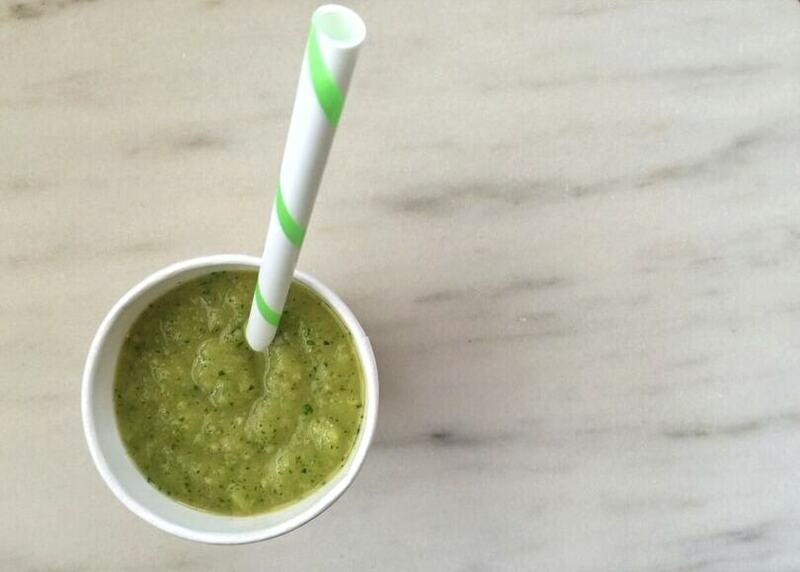 A very refreshing green smoothie, with a touch of sweetness from the banana. I’m starting to think it’s the acid I’m consistently wishing for. In this case, I need more lemon. The figs and ginger made this basic berry and greens smoothie a little more sweet and spicy. Again, the flavors are all very mild, but quite sip-worthy. The name is spot on for this deep red concoction. My best guess is that the acai or possibly the cherries are responsible for the bright fruity taste. It reminds me of the powerfully flavored nondairy cherry ice our local ice cream shop serves up when those beauties are in season. Berry Brightener is on display here, with its vivid reds, alongside Chocolate Lovahhh and Green Monkey. Fruit + chocolate is always a winning combination, and Daily Harvest capitalizes successfully on that match here. The overall flavor and texture is reminiscent of chocolate soft serve ice cream, with a familiar and pleasing creamy milk chocolatey finish. Despite having no sweetener, this coffee extravaganza made my top 3. It’s creamy, without an overly strong coffee flavor. I liked it better with the thinner, more watery almond milk rather than the thicker, richer soymilk since the coffeeness didn’t get lost . I usually have a smoothie and green or black tea in the morning, but I can see having this all on its own and taking care of two morning beverages in one cup. This pale pink preparation was unexpectedly great, and I opted for soymilk to double the protein content. The cocoa nibs added a nice crunch nestled amid the cold creaminess. The. Best. One benefit of my doofus ordering mistake was that I got to enjoy this one twice. It had lots of texture, and I was pleasantly surprised since I’ve never thought to put pumpkin seeds in a smoothie before. And it was a lot…a full 1/2 cup, which is responsible for the outstanding protein content. You may have noticed that my highest rated smoothies are pretty much all the ones made with dates. And the highest calorie ones. They offered many more layers of flavor that made me want to keep slurping them up my straw. Since I consider a smoothie a stand-alone breakfast (beside a cup of tea), the calorie contribution of these heavy hitters is still within normal limits. 300-500 calories before I leave the house fits just dandy into my 2000 calorie target for the day. On the practical front, I found they all needed a little more than 1 cup of liquid to get to a pourable consistency. Also, it’s best to use cold liquid, like refrigerated water, coconut water, or nondairy milk – not the room-temperature stuff straight from the tap or pantry. At home I don’t get too adventurous with add-ins when I assemble my own smoothies, except for maybe some chia or hemp seed. 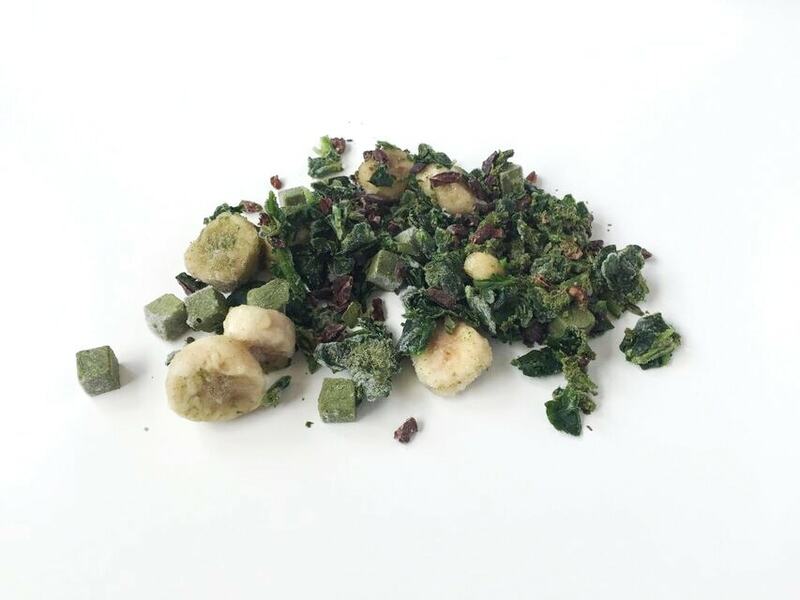 But Daily Harvest makes use of camu camu (a fruit), chlorella (a type of algae), and maca (a vegetable), all said to have particular health benefits. I’m not entirely on board with those claims, but if you want to know more about them follow the links I’ve included. I sort of view this service like the dinner delivery kits. It’s probably not feasible long term financially, but it might be nice to take advantage of every once in while to streamline your week. 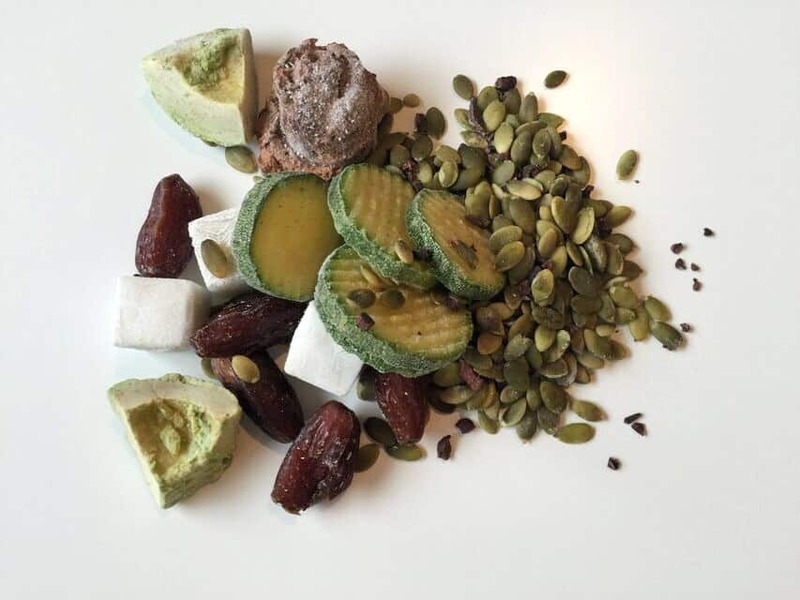 Or it might show you what’s possible in terms of smoothie variety which could be a transitional step away from donuts or cereal for breakfast. Maybe their fancy formulations will inspire you to make a copycat version at home. (I measured out all the ingredients in the Cacao Kapow for this very reason, and now I’ve got a rudimentary recipe to experiment with.) 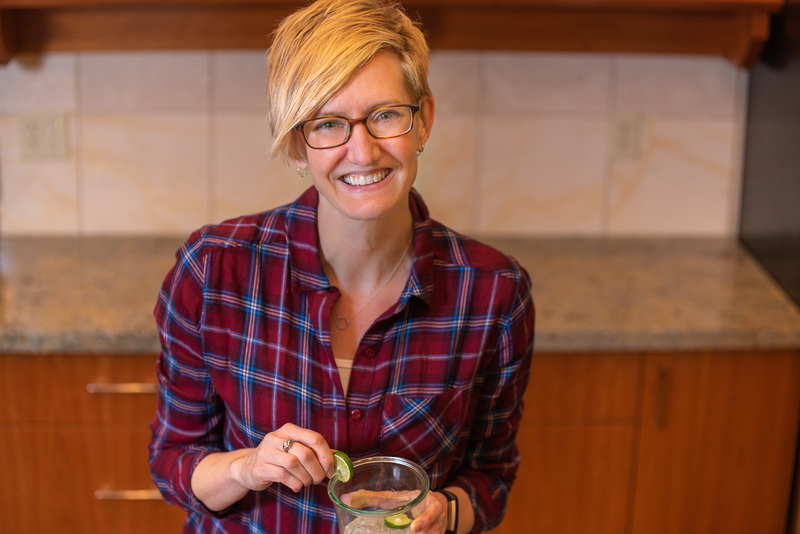 Or in my case, it might motivate you to do a little batch smoothie prep on your own on the weekends to make the weekday mornings more efficient and delicious. 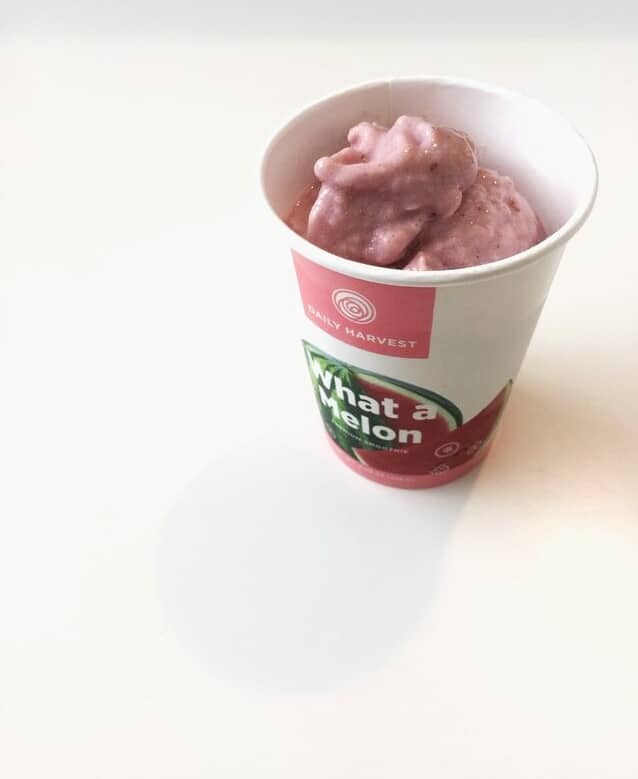 Whatever the result, sampling and evaluating eighteen cups of fruity vegetabley goodness was an enjoyable exercise for this smoothie enthusiast. UPDATE! 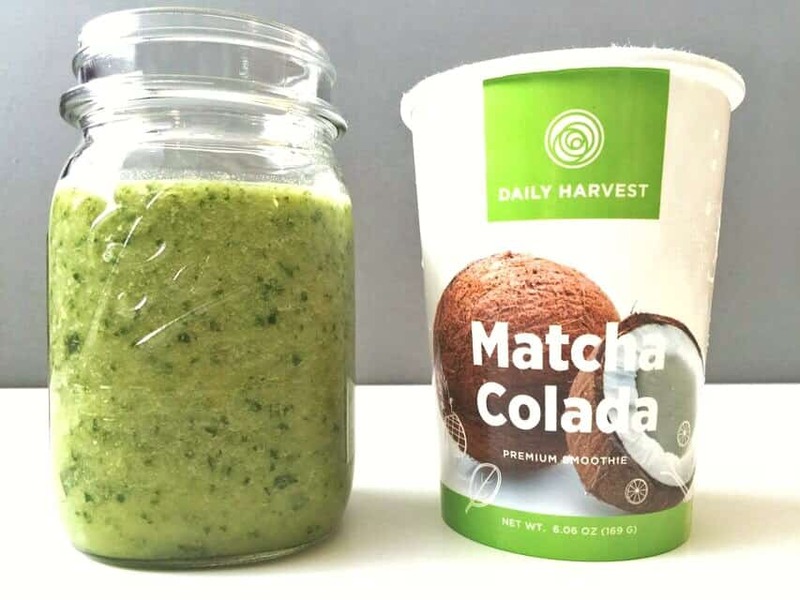 If you’d like to read a more current review of this product, check out my October 2018 post: Daily Harvest Smoothies, A Vegetarian’s Review Part 2. 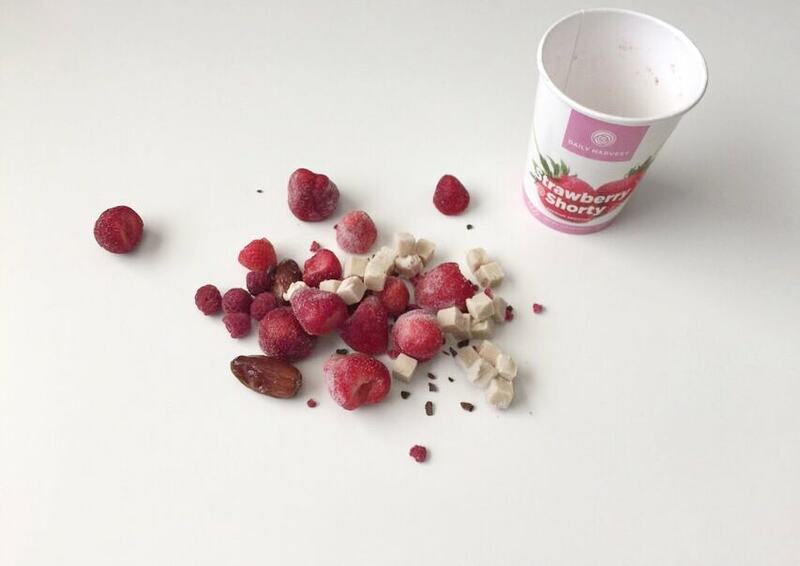 How do you make your smoothie habit more convenient? Got any blender-friendly tips to share? *Since this original post, I recreated the Cacao Kapow smoothie recipe. I’m wondering a bit now about the nutrition facts on the package from Daily Harvest. According to the label, this smoothie has 370 calories if you drink the whole thing (before adding milk). But, I measured out 1/2 cup of pumpkin seeds in their cup, which by itself has 360 calories. When I did my own analysis of my copycat recipe the numbers were considerably higher. It’s entirely possible that I am wrong, as I am often wrong, but consider that there might be some variation in the numbers listed here. Well, some combinations look interesting although the price for a handful of frozen ingredients in a paper cup seems unreasonable. Good source of inspirations though! I also wouldn’t worry for food waste when trying to recreate the smoothies. I often freeze excess of fruit. Not sure If it would work for watermelon – but actually why shouldn’t it? Hi Kate. I so agree. Thanks for your comment! I freeze watermelon and it works quite well in smoothies! Oh! Thanks Sharon. Good to know. It takes me literally 60 seconds to make a smoothie. I freeze all my favorite fruits so I always have a bunch on hand in my freezer. I toss in whatever I’m feeling, I always start with frozen bananas and I add different liquids like orange juice, cashew milk or coconut water. I add protein powder or almond butter for more substance. Literally, it’s so quick when you have everything frozen before hand! Hi Sharon! I agree. When you’re prepped and ready, it comes together so fast. Then it becomes kind of a habit you get used to and it doesn’t really seem like much work at all! I use fresh mango and avocado as a base for the smoothies as well. I use them interchangeably or whenever I don’t feel like having banana aftertaste. Both (mango and avocado) blend well, giving rich, smooth texture. Avocado as a starter is more demanding taste wise – you need to choose other smoothie ingredients more carefully – but as healthy as it is, I actually don’t mind. Hi Kate. I’ve just started using more avocado in the last year or so. Now I’m in the habit of buying them, cutting them up and keeping some on hand in the freezer. They’re a healthy fat and extra creamy, so they’re perfect for smoothies. 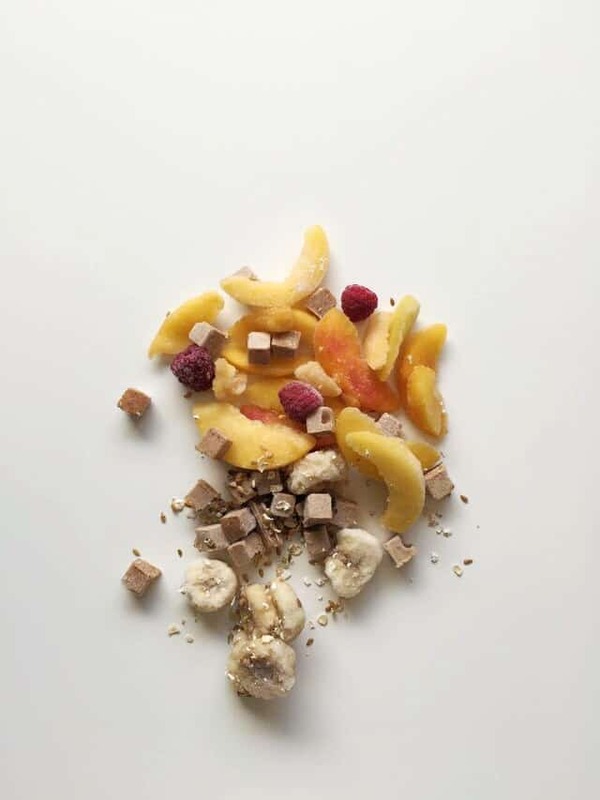 I have been using Daily Harvest for a couple of months now, and the smoothies are delicious! The mint is my fave. If anyone wants to try out a week and get two free smoothies in your first order, feel free to use my discount code. I just started enjoying my first shipment of DH. What makes me happy besides the convenience and taste is the fact my 12 year old seems to like them. Considering her penchant for Vanilla bean fraps and salt & vinegar chips, I love that she’s getting more veggies and fruit and healthy fats in her diet. She is 12 however so she likes to add half a banana. There are some months I’m able to get in the swing of doing this on my own, but for right now the convenience and variety is perfect. Hi Deej. I’m so glad your daughter is enjoying the smoothies. Thanks for taking the time to share your experience! I am leaving a negative comment on Daily Harvest. Make a long story short, I placed an order for a box of 24 smoothies two months ago and still have not received them. There have been a dozen emails back-and-forth between me and customer service to no avail. I also do not have anyone answering their customer service phone number, which seems pretty shady to me. Hi Niki. Thanks so much for your comment. I’m really sorry your experience has been a negative one. I hope they get things straightened out soon. Ugh. That’s a nice idea. It adds a little variety to the flavor if you’re someone who drinks them on a regular basis, and it boosts the protein. Thanks for taking the time to comment! File a report with the state’s better business bureau. Usually gets things moving. I received my first batch about a week ago and I love it. I ordered a mix of soup and smoothies. 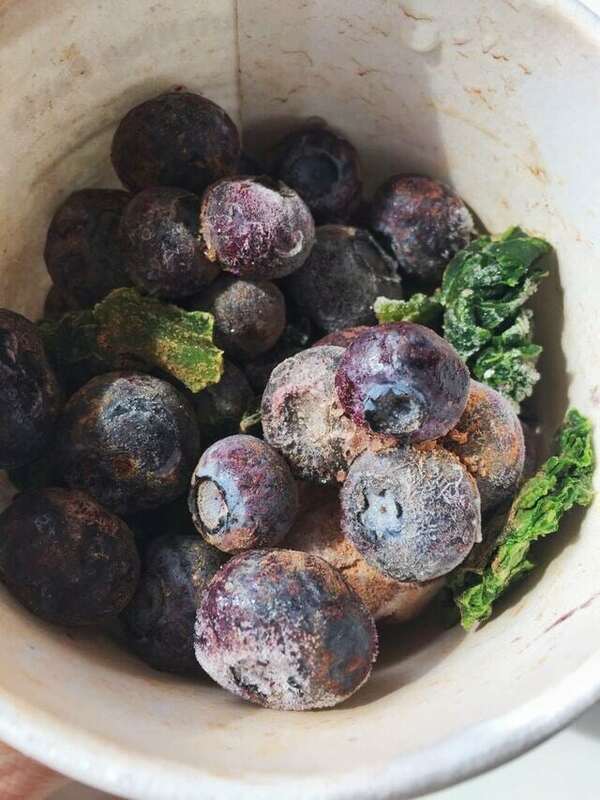 I’ve always bought fresh veggies and fruit with the good intention of freezing and making smoothies later, but time always gets in the way, and the fresh stuff goes bad usually before I can use it all. Waste of money and food. DH is a bit expensive, but for me — seemed I was throwing the money (and food) away anyways. I particularly love the carrot / ginger soup. Hi Kelly. I’m so glad you were pleased with their products. I haven’t tried the soups yet, but that’s on my list! My wife and I decided to give their service a shot. We selected 5 smoothies and a soup. Out of the 5 smoothies, 4 of them were bland at best with the Blueberry Hemp being outright awful. The serving sizes are on the smaller side especially considering the price. They come in “convenient” cups that seem more wasteful than anything and end up soggy and weak almost immediately after adding your milk/juice/water. The soup was the real let down however. I was floored by the incredibly high sodium content. Unfortunately that discovery was made after my wife came down with a headache shortly after eating it. All of this food is supposed to be healthy and fresh but don’t be fooled! Try finding the actual nutritional value on their website. You have to jump through several hoops and clicks for that information. Once you find it, the info is misleading. The Mushroom + Miso soup states 670mg but look closer… that’s for half of their already small serving size! That is absolutely absurd! That quote is directly from their homepage and I’m here to tell you that it’s a blatant lie! Due to their once a week shipping schedule the flexible frequency is questionable at best. We had to make our selections for the following week before we had even tasted our first order!? You can technically pause a week but you have to do it before their bizarre cut off times. 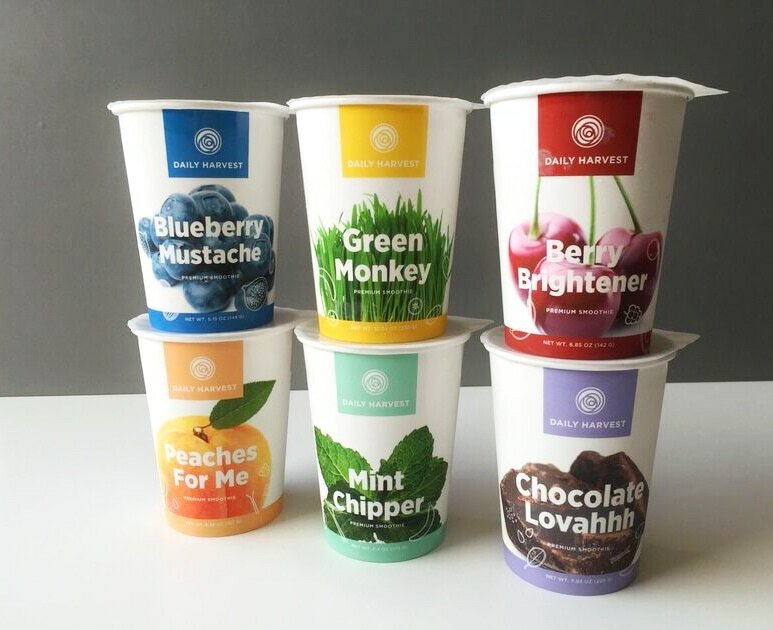 Silly naive us, we were optimistic about what had just received but yet to try so we gleefully selected 6 new flavors to beat their cut-off time. Sadly that hope was smashed when we both tried our first smoothies. We immediately regretted that second order. Despite the high price, we had high hopes for this service. Sadly I now find myself out more money than expected and trying to help prevent you from making the same mistake that we did by trying Daily Harvest. Hi Donnie. I’m sorry you didn’t have a good experience with the product. In fact it sounds like it was far less than good all around. All we can really do is share our thoughts and our own experiences and decide whether or not to use the product going forward. Thanks for taking the time to share yours. I just tried this and was pleasantly surprised. The mint+cacao one legitimately tasted like mint chocolate chip ice cream (and I think I may try giving it to my kids who are otherwise reluctant to eat their veggies). Yeah, it’s a bit pricey but if i go to the store to buy an organic smoothie it’ll cost me $10 so this is actually a pretty good deal. Overall pretty happy. 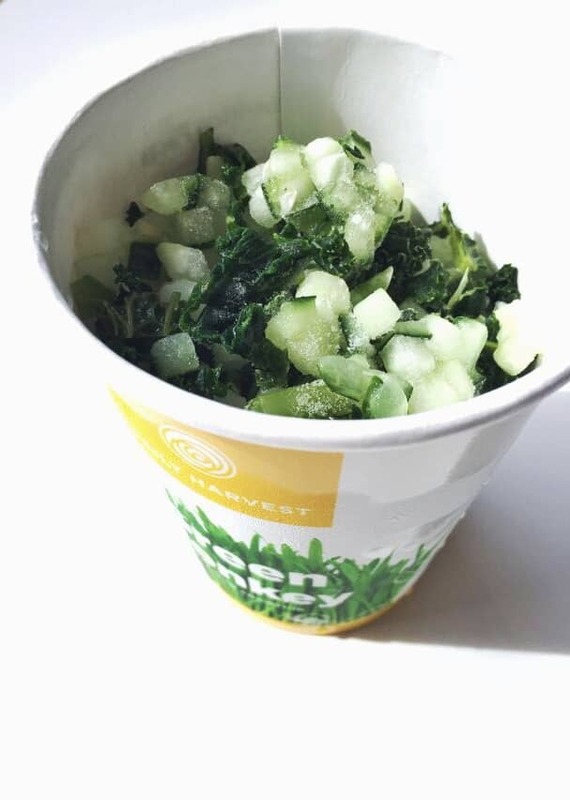 We are big fans of Daily Harvest. One of the big perks of my day is being able to try one of the new smoothies. Every one that I’ve had so far has been delicious. My fingers are crossed that it’ll continue to be as good. A lot of people say, “you can just buy the ingredients and make it yourself”. Yeah, I could, but I would never have thought of these mixes (e.g. mulberry and dragonfruit). Hi Dan! Thanks for your comment. So glad to hear their creative smoothie recipes are working for you. 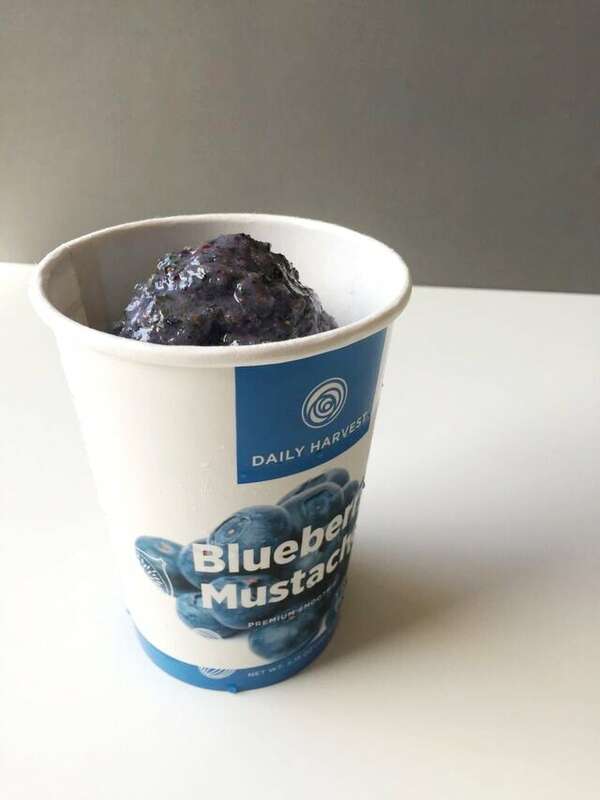 I ordered from Daily Harvest. The experience started off great, and ended not good. The customer service was so aggressively abysmal that I can’t let it slide. I ordered back in May to see what I could learn about different ingredients blended. They shipped…and the order didn’t arrive and didn’t arrive. Finally it did, 10 days later, stinking to high heaven, box crushed, fruit fermented and awful. I called them and they said they would compensate the shipment. Well they DID ship out another, but they also didn’t refund the first. Just to be clear, I didn’t pay for the bad shipment, but I did pay for the replacement – and I had to dispose of the rotted box, which took about 45 minutes and was super messy and disgusting. The next box came and it was fine, but I found I just wasn’t using the service, so I canceled. I went to the Account page to find where to do that, couldn’t find it, and finally on their help page found that I needed to email customer service with the work “cancel” in the subject line. I did so, and received an email a few minutes later that they had received my request and someone would get to me shortly. “Your request (78968) has been updated. To add additional comments, reply to this email. Thank you for writing in, and I’m sad to hear you want to cancel! In paragraph SIX it says that if I STILL want to cancel after hearing all the great ways they don’t want me to cancel, then I should log into my account and go to the deliveries section and do so. Well I work, and I didn’t get to paragraph 6 of the third email regarding cancellation after I told them I wanted to cancel. So two days ago I got an email that said my shipment was on its way. They must be referring to the instructions on paragraph six of email 3 regarding cancellation. Seriously? This is how they have people cancel, with this transparent trick bag into getting one more delivery out of the credit card until the customer ACTUALLY freaks out and makes it their job to follow up? I turned the shipment around and disputed the charge on my credit card. Their answer? Their goods are perishable and so they regret they cannot offer refunds. My big problem is the scavenger hunt that is their cancellation process. If they want my money for a subscription, they need to accommodate my cancellation without a big production. Good product, and ultimately I wish them well. But this was two hours I did not need to spend dealing with this silliness. Apparently though I now have store credit that I will never use. DO NOT ORDER THIS. THEIR CUSTOMER SERVICE IS HORRENDOUS AND THE PRODUCT DOES NOT EVEN TASTE GOOD. STAY AWAY AT ALL COSTS. I COULD NOT RECOMMEND SOMETHING LESS THAN THIS PRODUCT. 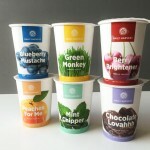 THE PACKAGING IS HORRIBLE FOR THE ENVIRONMENT, INTERESTING FOR A “HEALTH FOOD” COMPANY. BEST THING YOU DECIDE TO DO TODAY IS NOT ORDER THIS. Bad product and even worse customer service. Wait until you try to cancel your subscription. They continue to charge you and send product. Worst experience. Don’t get involved. Thank you for the review and recipes! What I like to do is basically what Daily Harvest does…meal prep and have them ready in the freezer. I’ll freeze all the “freezable” ingredients in a freezer Ziploc bag, and do lots of these at a time and different combos. Then, just pop it in the blender in the morning with liquid + protein. Saves time AND money. I’m thinking of doing the same. I was wondering if I could freeze little cubes of almond milk to make it all the more faster. Anyone know if almond milk can be frozen? I’ve definitely frozen soy milk ice cubes for smoothies. My guess is almond milk would work as well. I just came across your post as I’m trying to decide if I want to try DH. I’m trying Green Blender starting next week. One reason your calorie counts were different is because the nutritional information was probably for 1 serving aka half a container. I’d love to know which you like better if you try them both. Wow, thanks for the review it was really helpful and am grateful for your work in writing this! Honestly your review is the bestest of reviews of dailoy harvest. Everyone says everything is good from there so thanks so so soooo much for your honestly. I love your blog and how you know to re create their smoothies too<333333.